L31'4"x W17'6"x H24" One of the Largest Slides in all of Florida. 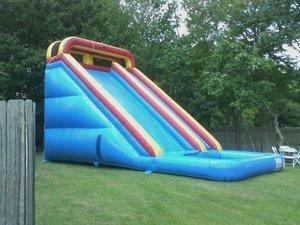 This Huge Waterslide stands a impressive 24 Ft. High yes 24 Ft. High. This Waterslide is alot taller then most Giraffes. Can also be used by adults.